Michelle Pacheco is an International Spiritual Teacher trained in Romania and USA. Michelle was born in Bucharest Romania during the country's communist reign. Despite the fact that it was difficult to access information about spirituality, growing up, she was fascinated by the "unknown" of the human spirit. Growing up Michelle followed the conventional path of the three dimensional world. After finishing school in Romania and graduating college she moved to the United States where she entered the corporate world and worked as a skilled Travel Manager and Strategic Sourcing VP for financial corporations. But she was not satisfied by that life, something was missing, and wanted to follow her true calling and become involved in the spiritual world that she was attracted to since childhood. During her life Michelle participated in many spiritual workshops, studied with numerous teachers and masters, participated in spiritual gatherings around the world until she found her true calling and the right path for her. 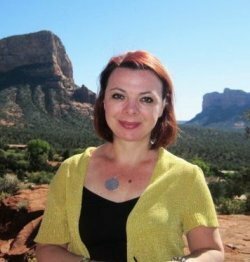 Michelle began practicing Reiki twelve years ago in 2002 while visiting her native Romania. There she connected with her first Reiki Master, Dr. Ovidiu Dragos Argesanu . The experience was a gift from the universe. Following this experience Michelle practiced Reiki on close family and friends and followed the guidance of her angels. She began to learn and practice Karuna Reiki and Shamballa Reiki Michelle worked with several Reiki Masters including William Rand, the founder of the International Reiki Center with whom she is enrolled as a practitioner member. �? ?Once I found Drunvalo, I understood how completely connected everything is. Life everywhere is one and if we do not remember this we cannot remember who we are. This was a very powerful message that changed my life." The study of Shamballa Reiki led Michelle to the Living in the Heart books, the Flower of Life, and Drunvalo Melchizedek with his incredible teachings. Working with Drunvalo, Michelle understood that it is all about the power of the heart, the unconditional LOVE that can spring from all of us. In 2010, after closely studying Drunvalo�? ?s teachings and participating in his workshops, Michelle enrolled in his new Certified Teacher program to become part of his School of Remembering. With Drunvalo�? ?s guidance, once she became a Certified Teacher in July 2011, she has hosted over 50 Awakening the Illuminated Heart workshops around the world. Michelle works effortlessly every day to reach out to people who need help healing emotional traumas that stop them from being able to open their hearts. Her goal is to help as many people succeed in clearing these traumas, open their hearts, and successfully practice Drunvalo�? ?s Meditation of the Heart. In her effort to find new healing techniques to help her students and patients, Michelle came across a practice knows as Breathwork or Rebirthing with Dan Brule. (link - http://www.breathmastery.com/ ) Michelle understood that breath is an essential part of the healing process. As Drunvalo says, �? ?ALL YOU NEED IS TO BREATH AND LIVE FROM THE TINY SPACE OF YOUR HEART.�?� Since discovering this incredible work Michelle became a Certified Breathwork Practitioner and has helped numerous people heal. Breathwork has allowed her to open a new door for them to discover the incredible world of spiritual work. Breathing is the most important element of a perfect, balanced, and healthy life. She understood that through Breathwork we can all awaken to a higher level of consciousness. One can use these teaching for healing health problems, or for a higher spiritual purpose. Michelle used breathwork teachings in a corporate environment as well as with spiritual groups, and in private sessions. The breathing techniques used can be applied by anybody for healing, or in a corporate environment, while dealing with difficult colleagues or clients in the office. Michelle organized numerous breathing workshops for Dan Brule and for herself, in USA, Romania, Portugal, Macedonia and successfully started the Romanian Breathwork Association, where currently she is working with more than 15 practitioners in spreading this work thought the country. The mission of Michelle�? ?s life and work is to find a way to help people reach their full spiritual potential and most importantly to remember the power of their hearts, the power they have within themselves to heal, and bring peace and happiness into their own lives without outside intervention. She says we ALL have this ability within. We just need to remember how to bring it to LIFE again. �? ?We are not meant to be unhappy and suffer. We are here to remember the love that we can give as the incredible spirits that we are. We are capable of so many wonderful things�?�. But we must allow ourselves to let go of our egos and control. Reiki �?? Multiple systems �?? Practicing healer and teacher since 2002 with numerous workshops in USA and other countries around the world. Life-changing Event/Workshop. Since i have known Drunvalo's work, for me this was the step that i hoped in my spiritual path (and what a step, more like a giant leap...). Thank You, Michelle, Drunvalo and all the other speakers out there in the world... Blessings! Lets, say, its hot in Lisbon and maybe we should use som persiennas or curtains, that can give som shadow...and maybe a local that can handle all the nessecary electrical tools, thats good for this workshop. This workshop was completely amazing, it's bringing intense changes in my life. It's not always easy to stay centered in the heart, but now it's as if it points to me everything that I don't accept in my life and want to change... Specially emotional stuff I needed to get through. It gave me the courage and the wisdom to feel my pains, go through them and stay centered. I will never forget this nor this way of living. It opened a big door. Thanks to Michelle, Drunvalo and the school. It was very good experience work with teacher and group! Very friendly atmosphere. Michelle help me to do set -up password for SOP The healing sessions was very powerfull and emotional. Hello, the ATIH Workshop was an incredible experience 4 years ago. It was impressive and emotional. But even though I resonated highly and even though I had a great teacher, while the activation happened and while the cleaning & healing was - I'm sure - deep, because I was very blocked and not capable to visualize or feel much, the effects of the workshop for me personally were short lasting. Immediately afterwards, I practiced the meditation and readjusting of the beams of light, I did the programming, but I could not really keep the effects of the activation. However, I am an exceptional case. Hopefully the only one at this extreme (I'm saying that because I never met anyone like me, nor did any of my therapists, masters I worked with, etc. ), but just in case there are others who might be blocked at a certain level, maybe this aspect should be addressed more in the preparations of the teachers and maybe a different kind of clearing applied at the time of the workshop (that specifically targets the blockages, at least a part of them, since not all of them can be addressed). I got a chance to learn more about my blockages and I realized that they can be both internal (in your subconscious mind) and external (one of which is the astrogram/the astrological influences, but there are others as well). Of course, both of these types of causes can be karmic or not. At the time I also had a powerful negative entity with me which did not leave just because of the cleaning session (it went away years later). Anyway, I do not know how the workshops are happening today, maybe the clearings are deeper, but I think this is an issue the teachers should keep in mind. Thank you for all the great work for humanity. Michelle is wonderful. She is a gifted teacher and guide. Her understanding of the material and depth of knowledge is impressive. I feel blessed to have taken the class with her. I can honestly say that this workshop and Michelle as the teacher/facilitator were both beyond positive words. She did an absolutely fantastic job presenting the material and guiding the class through the course!